Will you be at the AAM annual meeting next week? 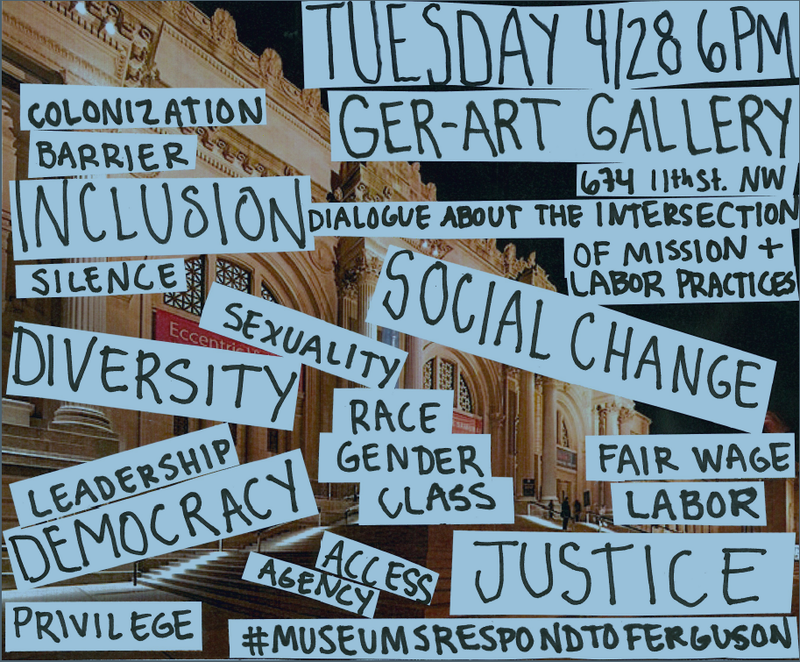 Check out this “rogue”, conversation-based event on internal museum labor practices happening Tuesday 04/28 from 6:00-7:30 PM at the Ger-Art Gallery (more info below). See you there! This conversation cultivates a space for emerging museum professionals, graduate students, and museum staff members to consider the 2015 AAM conference theme “The Social Value of Museums: Inspiring Change” in the context of internal museum practices including hiring, leadership, and working environment. This conversation is a “rogue session” and we invite you to join us outside of the conference. Our goals are to provide a forum to begin this conversation, to counteract the silence/taboo around discussing labor in museums, and to examine how working conditions impact diversity in museum staffs.In contrast to the dominance of museum leaders’ voices in the discourse of social justice in museums, this conversation is facilitated by a diverse team of emerging museum professionals who are uniquely aware of the challenges presented by working in this field, particularly barriers to entry and advancement rooted in race and class. We approach this conversation with a shared perspective: Many museums have a stated commitment to acting as agents of social change, but we see an inconsistency between this mission and museums’ internal labor practices. We believe that only once museums recognize and resolve their internal inequalities can they truly begin to act as agents as social change. Participants who may critique or challenge this perspective are equally as welcome as those who agree. Our intentions are to amplify and support social-justice-oriented museum professionals’ statements that the internal transformation of museums is a necessary step toward enacting social change, and to facilitate a conversation that leads to action. Ger-Art Gallery is a new space in Atlanta to show modern and contemporary art from Latin America, with a growing interest in showing local art and serving as a cultural bridge between the two. The gallery can be somewhat difficult to get to via public transportation, and we encourage you to use Uber or Lyft. If you are a new Uber user, you can use the promo code dr5qr to get your first ride (up to $20) free! Because space is limited at the gallery, we encourage you to use the RSVP via this form so that we can anticipate the number of participants. We will be using the hashtag #MuseumWorkersSpeak to get the conversation started on Twitter begining today — please join us!